The New Year is upon us, and with it thousands of New Year’s resolutions are being put into action right now. If you’ve already made your resolutions, you may need to check your mailbox, because there may be another one waiting to be made after you open your credit card statement from December! Many tend to overspend during the holiday season and then get shocked back to reality in January when the bills begin to file in. 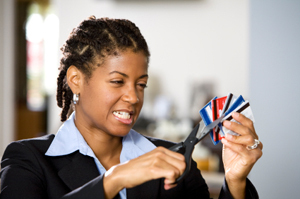 Don’t let your holiday spending get you down, let the experts at the Equifax Finance Blog guide you into a debt-free 2013! Paying Off Holiday Debt,” the financial experts offer great tips and advice for holiday spenders to use when creating a plan to pay off holiday debt. One excellent tip is to negotiate for a lower interest rate on your credit card. If you have good credit, or have at least been a good customer of your credit card company, simply ask. The worse they can do is say no, but if they do help, it can make a big difference in your budget for paying off debt. The experts also suggest a balance transfer to consolidate credit card debt. However, make sure the monthly payment will not be too much for you. Also, check the interest rates before committing, because a good deal may not be so good if the interest rate is extremely high. ID theft protection, credit cards, credit reports and other helpful financial information. This entry was posted in Homebuyer Incentives and tagged credit card, equifax finance blog, holiday debt, ID theft protection on January 4, 2013 by Carol Morgan.